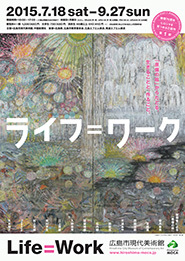 In observing the 70th anniversary of the atomic bombing, Hiroshima City Museum of Contemporary Art is holding a trilogy of exhibitions examining Hiroshima from three perspectives—its past as a city destroyed by an atomic bomb, its path of reconstruction, and its present and future. The first offering, “Life = Work,” opens with A-bomb Drawings by Survivors depicting actual experiences of the atomic bombing. On this footing, it then examines the work of 13 artists whose art deeply reflects their past experience, method of living, or life as a whole. 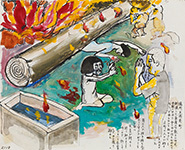 The works in some cases arise from the artist’s own tragic experience related to the atomic blast, war, or loss of loved ones. 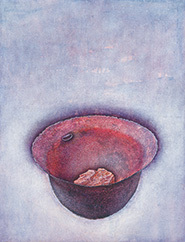 In others, the artist has no direct experience of an event but seeks to find a connection with it in his or her own life. In many cases, they are works the artist has devoted a lifetime to creating. As an exhibition directly linking life experience with art, “Life = Work” casts light on the sources of creative expression and reveals how an artwork—as a crystallization of the artist’s life—has a power to convey that individual’s experience. Then, by demonstrating art’s power to transcend time and cultural barriers for sharing by people everywhere, “Life = Work” shows what art can achieve. Supported by Hiroshima Prefecture, Hiroshima Municipal Board of Education, Hiroshima FM Broad Casting Co., Ltd., Onomichi FM Broad Casting Co., Ltd.